Remove the cutlets from the fridge 1 hour before cooking. To make the marinade, pound the garlic, lemon grass, ginger and sea salt into a rough paste in a medium-sized pestle and mortar. Add the herbs and pound for a further minute, then stir in the extra-virgin olive oil and mix together well. Mix the chops with the marinade and leave for at least 1 hour to infuse. Preheat the barbecue and make sure the grill bars are clean. Put the cutlets on the hottest part. Cook for about 2 minutes on each side for medium rare. Put on a plate and cover with foil. Let them rest in a warm place, lightly covered with foil, for 10 minutes. 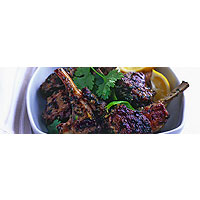 Place 3 lamb cutlets on each of 4 plates. Mix a little oil with the juices on the resting plate and pour over the cutlets. Give them a good grind of fresh pepper, place a lemon wedge on each plate and serve immediately. Fresh herbs and cooked meat make a delicious combination, but you have to be wary of the correct wine match. Try a smooth but herby light red, such as a Loire red.